Recently I needed a second camera for a shoot, so I got my 5D MkIV out for the first time in a while. And wow, I cannot believe how much I've gotten used to the R, and how out of date it makes the 5D feel to go back to. Yes in certain situations the OVF is nice, but in very low light I didn't realize how much easier the nice bright EVF of the R makes composing and taking photos. The 5D just feels dim and antiquated to look through, and part of me feels like the viewfinder itself is smaller than the R (???). The black outlines of the AF points in the 5D are easy to lose sight of, not to mention how restrictive it feels to go back to having one defined grid of AF points, all in the middle of the frame, when you've gotten used to moving the AF point seamlessly around the entire frame. Yes, the EVF is not quite the same as using an OVF, but I've found that that initial weird, detached feeling of using an EVF has pretty much fallen by the wayside after months of using the R.
And again, the autofocus. In poor light, while the 5D can function in most of the conditions the EOS R does, the 5D hunts around before it achieves focus when the lighting gets poor, and from past experience it's not 100% accurate when things get dark. Going back to this after using the R's quick, snappy autofocus that works under pretty much any condition you throw at it felt like going back in time. The R's autofocus feels advanced and assured. The 5D just feels like old technology. Not to mention I still can't trust the 5D's servo AF to work well at very wide apertures. Meanwhile, the R seems to just nail focus even in servo mode with a moving target at f1.2. Right now I have two 5D MkIVs, and initially thought the R would be an interesting camera to play with, but I still thought that the 5D would be my main go-to camera. But after realizing how much I've grown to like the R, I'm seriously considering dumping one of those 5Ds in favor of having two Rs and just having one 5D around for those certain situations where I still want a DSLR. **Disclaimer: I still recognize that there are a lot of cases where the DSLR will reign supreme... For very fast action, birds in flight, sports, etc, the DSLR is still probably the way to go. But for my uses, the R seems to exceed the performance of the 5D overall. There are still a lot of things that bug me about the R... Again, give me my joystick back, and I admit that the lack of smooth performance of the EVF during burst shooting is a little hard to deal with. 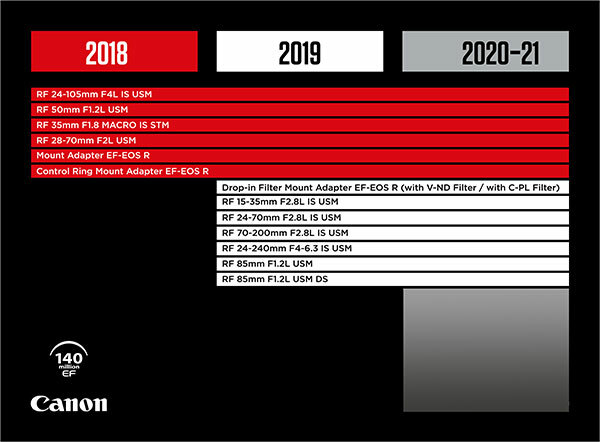 But I'm confident that Canon will get these issues ironed out on future cameras, and I think the RF line of cameras has a really bright future ahead. Edit: All of these impressions are with using adapted EF lenses only. I'd like to get the RF 50mm, but I'm waiting until they are a little cheaper on the used market. Thanks for sharing your impressions of using both systems - the old and the new one. Your comments and the recent discounts here in Germany this makes the EOS RP even more attractive to me. The EOS R is definetly not "my" camera. The RP as travel body and a future (call it) EOS R5 (EOS 5D Mark V equivalent) would be my my bodies of choice. My EOS R gets virtually all of my use, I used it yesterday for a few dozen shots. I have big hands, and constantly have issues with the camera focusing on the wrong place. Its due to the fact that my thumb touches the top right corner of the screen easily, so the camera focus spot is wrong. I really wish that it required a double tap to move the af spot. I use the touch screen almost exclusively, so I don't want to turn it off. I find my 5D MK IV to be much superior, but the R is convenient to have sitting on my desk because I can charge it once a week over usb C and it takes up less space. However, for a fast shot, I could get garbage if I don't stop and make sure the AF point is centered or wherever I want it. I usually press the delete button (Trash can symbol) to center it so at least I have the right starting place. I might experiment with taping something raised to the top right corner of the lcd to keep my thumb off of it. I had to shut off the 2s preview after each shot because I couldn't track the target after releasing the shutter button fully and the preview made handheld panos much harder. However, I would still like it to preview on the LCD if the camera does not detect the face near the viewfinder. Definitely agree that 1-shot accuracy is much better on the R and that ability to focus on a larger field is great for portraiture. I'll have to try out servo AF when the kids start soccer in a few weeks. I didn't have that many issues with the 5D4 with fast glass as long as I stayed with the cross types and the more accurate bank in the center. It's too bad that the frame rate is lower than the 5D4 and that it lacks GPS; otherwise, I would have sold off the 5D4 and gone all in on the R-ecosystem. As it is now, I still will rely on the 5D4 for travel, when I tend to use GPS and the longer battery life is more critical. For this type of travel (2 weeks driving around different parts of the country), I will also only bring EF lenses just because of the 5D4. The announced but not released RF holy trinity sounds great, but I won't bite until I can replace the 5D4 with a comparable/better R. I'm sure the RF versions will be better, but those lenses need to be used on both bodies. I still occasionally get R exposure issues when using the adaptor/EF lenses. It happened with a 300 f/2.8 and with the 70-200 more recently (1 week ago). In both cases, the adapter was mounted first, then the lens (natural when swapping lenses). The exposure shown in the viewfinder was 2-3 stops too high, and in both cases, switching from on-off-on fixed the issue. Oh yeah, the 2 second review popping up in the viewfinder is ridiculous. I've had that turned off since day one. However, I always had the review feature shut off on the 5D, so it wasn't a big deal for me. If I want to chimp, I'll hit the review button, but I didn't want to waste battery power on the 5D by showing every single photo on the screen. So, I've been used to no automatic review for a long time. Shutting off the faulty method of it in the EOS R was not a big deal to me. Another major downfall I dislike about the R is that you can't get it to work similarly to a DSLR... And by that I mean, shutting off the "live view" whenever you move your eye from the finder. I wish there was a way to make the rear screen only for menus and reviewing photos, but just shut it off otherwise. But at the same time, since I still find touch and drag AF to be a little cumbersome, I usually just tap the spot I will want to focus on on the touch screen before I raise the camera to my eye. So turning off "live view" would make that impossible. I haven't had that issue with exposure. Are you sure it's not related to the way the R seems to link exposure to the AF point? Again, I don't find the EOS R to be flawless by any means. There are still a lot of quirks about it that frustrate me. But, the actual experience of focusing and taking the photo quickly and accurately seems to outperform the 5D, at least in my use cases. And that matters the most. So, I'm tolerating the R's drawbacks while appreciating all of the ways that mirrorless exceeds what the 5D can do. I'm really hoping they get all the kinks worked out when we see a real pro-level mirrorless at the end of this year or early 2020. FWIW, the R and RP support the GP-E2 for positioning and date sync, but not shot direction using the electronic compass. The 'smartphone' GPS options using the Camera Connect app on your phone does a decent job as well, but I can't figure out how to keep the app always open. Some times it's open for hours, other times it closes after a few seconds. Probably bad interaction between the app and iOS. Having said that, I would very much prefer the GPS being builtin or at least an electronic compass. I don't think it's related to exposure-linked AF point. It was indoors the both times this happened and it was relatively dim (ISO 1600+). I could pan the camera and select different points to focus on, and it would still present an overexposed image until I turned off the camera. The first time this happened, I took a picture to confirm that the meter was inaccurate (didn't save it) as opposed to being just a VF issue. It seems that in R the order of mounting adapter and lens matters, somehow. In my case, with extenders (AF enabled Kenko brand extender for macro) when I connect extender to the camera first and then the lens, the camera shuts down and I have to power off and on to get it work. But when putting extender on the lens and then connecting them together to the camera, everything is fine. Same happens when disconnecting them both (ok) and individually (ng). And this happens with not only one but a variety of lenses. Even though I really liked my EOS R, I sold it and, 2 days ago, ordered a 5 D IV. Still prefer the DSLRs, mostly for the OVF and ergonomics..I'm mostly in landscapes and macro, so AF speed isn't too important for me. Yet, my next camera- don't tell my wife - will be a high-MP R model . I'm with you there. I really wanted the Eos R to work for me. The allure of the (still not released after 6 months) Ef adapter that allows filters...the next evolution in live view AF...but it's like canon outsourced the UI to another company. I've never used a canon camera that felt so alien, it was like using a different brand of camera. I found the EVF excellent for an EVF...but not as nice as a good optical view finder. I found a huge disconnect using the AF...it kind of had a mind of it's own and the face tracking was a bit hap-hazard for me. It felt like a lot of processing was going on under the hood and if it needed to do more calculations then the AF wouldn't respond until it had worked out what it wanted to do. Also the AF tracking seemed to be only as fast as the EVF was able to display the moving box data...which also felt a bit disconnected. I really appreciated the guys here who can make the Eos R work fro them...in some ways I am a little envious. But I really get fed up with the whole "EF is old and dead and Eos R will take over the world and bring world peace" mantra. There is a place in the market and in our bags for both...in a similar way that full frame and EFs does. Each brings benefits to our bags. In terms of glass, I think the new Rf lenses are hugely over hyped and over priced. Sure they focus a bit quicker and they are sharp for sure. But we all know that the Rf mount's benefits are for wide lenses only due to not having to retro focus. So anything over 35mm generally isn't going to make much difference on a mirror less camera. A Rf 400mm f2.8 isn't going to me much different than a EF 400mm f2.8, unless Canon have been holding back on the EF lenses. I suspect Canon has been holding off the DO lenses for such a time as this. The new Rf 70-200 2.8 is a good example, there is nothing in that lens that can't be applied to the EF mount. It's only shorter because the lens extends. Once it extends it's actually physically longer than the EF version. We all know Canon could have made a 50mm f1.2 for the EF mount that is just as good as the Rf version. They haven't...purely for marketing reasons. I think that the Eos R is a very capable camera which is an amazing first attempt. Give it a few generations and the Eos R will be a very very capable system. My preference for the EVF is specifically around poor lighting conditions. Everything is very dim and the AF points on the 5D are very hard to see in poor ligthing. In good light, yeah the OVF is still probably better. As far as the AF, I am not using any kind of face detection, tracking, etc. I think we're still a long ways away from any of those systems being something I feel like I can rely on. I'm using single point only, and moving it to where I want to focus. All of this intelligent autofocus stuff needs to get many times better than it is now before I feel like it's worthwhile to use. Yes it's slower to manually move the AF point around (again, I want a joystick), but at least the AF system isn't way off in the weeds focusing on something I don't want to focus on. As far as the lenses go, if you look at the back of the RF 50mm 1.2, there is glass all the way back to the very rear of the lens. So, whatever they're doing with the optical design of that lens, it's not something they could do with an EF lens. It does seem like the biggest advantage of the RF lens mount is for wide angles, but I think it's clear that it offers some advantages for normal focal lengths. I agree with you as far as telephoto lenses though. All of those appear to have a lot of air in the back of them even with the EF variants, so I don't see a lot of advantage to shortening the flange distance. I also agree related to the 70-200. I think it's kind of cheesy to tout how much smaller you made the lens when in actuality you just changed it to a less durable design that extends in and out. And yes I agree that right now the EOS R is a flawed, underdeveloped camera. But, the technology is already offering some advantages over DSLR, which has been refined over a very long time. Once they get the bugs worked out of mirrorless, I think it will be better than DSLRs for almost every case. That's about how I felt. I see the great pictures coming out of it, I hear the raving... but mine went back. Then I started lusting after it again, but it's a lot of money for a body I don't love. For me, the "bright" EVF that people seem to like made me overestimate how much light was available, the buttons were in the wrong places, and it wasn't THAT much smaller than my 5D3. The touchscreen was slower than the joystick for moving AF. I'd love to have one with the USB-C charging for travel, but that's a lot of money for a travel camera. I might just swap my SL1 to an SL2 or M50 and use that for trips. I rented an EOS R for a week to see how I'd like it, and just sent it back yesterday. I found that it had pros and cons (like most people), but I'm undecided. Since I'm in need of a new body, but I want to make sure I'm making the right decision for me, I'm also renting a Sony A9, and a Panasonic S1R. With the R, I did like having all of those additional auto-focus points over my 5D3. That was awesome! It let me get a lot more keepers that didn't need cropping to get the look I wanted while moving around quickly. I really liked the focus mechanism that let me keep it up to my eye and adjust the focus. I liked having the EVF to give me an idea of what my shot would end up looking like. I got some good shots out of it, and that made me happy. The RF-EF adapter worked well for my Canon lenses as well as my Tamron 150-600 G2. Can't beat being able to use my existing lenses on a new camera! I was also pleased with general AF performance. With the RF lens I rented, it was quick, as was the 70-200 2.8L II. The Tamron was a little bit slower, but not terrible. It also felt good in the hands (good ol' Canon ergonomics!). Where I wasn't as happy was the noise. While this may be user perception and not reality, I felt like the noise in the images at ISO 2000 and 3200 was similar to my 5D3 at a slightly higher ISO. That doesn't feel right, but it is what it is. It could've been the shooting conditions, I don't know. I also wasn't happy with the Face/Eye detect performance. It failed quite often, and needed perfect light to work well. My 2 year old Panasonic FZ2500 does a better job with face detect (it doesn't have eye detect). While I know that it may be a "niche" feature, when either out with the family, or shooting a wedding or portraits, having something that locks on to the face/eye is really handy and results in more keepers than not. I'm curious to see how the Sony and Panasonic FF Mirrorless work out now. This is a bit of an issue for me too (having come to an EVF for the first time). I was ending up with darker images than expected back home on screen. I've starting using the histogram in the EVF to keep track of reality. The ability to zoom (5 or 10x) in the EVF is, by the way, wonderful! Since getting my RP (I know it is not exactly the R), my much loved 5Div is sitting in my bag. In fairness, I still need to give the new body a workout (planning a trip with the grandkids so we'll see) but I have things set the way I like and, at least with the RF24-105 lens, I like the RP. Seeing the histogram and the image in the EVF "real time" is a plus, especially in limited light. I've gotten better at setting the focus point with my thumb. I'm going to bring some EF glass and an adapter on the trip. At this point, the new body is a backup or secondary body. But, maybe when the next R model arrives, that will change. After using my R for a couple of months now I am of the opinion that it is best suited for lower light situations both outdoors and indoors. The AF is superb and has never failed me. However the EVF is very inferior to the OVF of the mk4 in bright sun. I struggle to see any detail in shadow areas and have failed to see distracting or unwanted elements in the shadows that are easily seen in the OVF. Backlit situations are also hopeless. The AF nails it but the hope of seeing the expression of a person in a backlit situation is futile. I also prefer the snappiness of the mk4. The R wakes slowly and has a slow-ish feel to its operation. Mostly this doesn't matter but in some cases it does. As for the customization options, they make for a camera that seems overly complex as the plethora of buttons and their options can be hard to remember. I have actually minimized the options for display, playback and general fooling around. I usually stick to manual mode and never use video. The one thing that really bugs me and is purely esthetic is the sound of the shutter. Without a mirror, one would think the manufacturers would think about how noisy the shutter is and the quality of that noise. I have always been repelled by the sound of the 5D series shutters until the mk4 as they sounded like hedge trimmers to my ear. The mk4 is much better but Nikon has been the leader in this area for years. Interestingly the Fuji X-H1 is the standard here with a mechanical shutter that is nearly silent yet still permits flash use. The R has a metallic "chink" that bespeaks cheapness. And why can't we have 1/250 flash sync? I can cheat 1/250 outdoors if my subject is not too close to the bottom of the frame on the mk4 or the top (?) on the R. But the extra increment would really help. Overall the I am quite happy with the R in use for events and portraiture. For landscape and architecture it offers no advantage over a DSLR. Mirrorless is much like any other new tech. Some good points and some less good points but it will not save your life or let you see God. I used an EOS R for 4 months. I didn't like it and sold it. Anyone else come to the same conclusion? I went back to a 6D Mark II for full frame and my M3 and M50 for travel and hiking. I'm also coming from a 5d4, and I agree with many people here, the autofocus accuracy of the R won me over. It has also allowed me to use 3rd party lenses again, since it was hit-and-miss on my 5d4, now I have no problem using Tamrons on the R (although RF lenses are still faster). The only thing I miss from the 5d4 is the dual card slots and remote receiver (I hate how I have to attach a JJC receiver versus just having the rc-6). I think it is apples to oranges, yes, the focusing accuracy can be superior on mirrorless cameras (there are certain kind of pictures which are just much easier to take) but with DSLRs taking pictures is generally requires a more focused mindset, need to focus on getting the exposure right, the focusing right, the controls are different etc. or rephrasing it I would say that all the technical advancements (seeing how it tracks the eye, etc.) may take away some focus on actually taking the picture, which is still what this is all about. It is a bit interesting that current Canon DSLRs have this bipolar personality between using the viewfinder and LCD. Of course at this point it is quite clear that DSLRs will not make huge steps forward at all anymore (Actually, their LiveView/video capabilities that will probably improve more, very little to change regarding the rest, maybe they will add in little things like automatic AF calibration) and that even more impressive optics can be made for a new platform. Although very little has been said about it. While everyone is taking about AF, I am still also intrigued by the return of using manual lenses, with the constant evolution of the LCD screens and EVFs it is starting to get more and more easy (it provides very nice results and it is still a more conscious approach then letting the camera do its thing).